The first ever World Series of Poker Europe tournament kicked off in London on Thursday with 105 of the top names in poker competing to claim the first-ever WSOP bracelet awarded outside the US. Many of the competitors in the &pound;2,500 HORSE tournament have already claimed WSOP gold, including Phil Hellmuth, Johnny Chan, Doyle Brunson, John Juanda, Annie Duke, Jeff Madsen and Max 'The Italian Pirate' Pescatori. The combined entries into the historic event created a &pound;70,875 first prize. This WSOPE HORSE event was structured differently than the WSOP HORSE events in Las Vegas this summer. In this event, eight hands of each game (Hold Em, Omaha Hi/Lo, Razz, Stud, Stud Hi/Lo) make up each level. Blinds were raised after one full rotation of each game, with a break every 100 minutes. Due to the size of the field, the tournament started off spread out over two floors of the casino, with no spectators allowed in the poker room due to the crowd of players. With a field full of poker's biggest stars, some truly spectacular starting tables were created. One table held Tony G, Andy Bloch, Jeff Madsen, Jennifer Harman and Brandon Adams. Another table had Allen Cunningham, Gus Hansen, Marcel Luske and Justin Bonomo. And yet another featured Scott Fischman, Lee Watkinson, Jani Sointula and Jesse Jones. Some of the American players, like Doyle Brunson, flew in early in the day and experienced some jetlag to start the event, but others like Kirk Morrison had already been in Europe for the EPT Barcelona event. Marcel Luske was the first of the day's eliminations when Gus Hansen made a flush in Stud to best Luske's two pair, aces and fives. Luske was joined on the rail before dinner by Michael 'The Grinder' Mizrachi, Tony G and Andy Black. Barry Greenstein and son Joe Sebok were registered for the tournament but never showed for Day 1. Greenstein was blinded off early in the evening. As the evening wore on, the pace of eliminations increased, with Doyle Brunson, Jesse Jones and Ben 'Milkybarkid' Grundy all heading to the rail within minutes of each other. 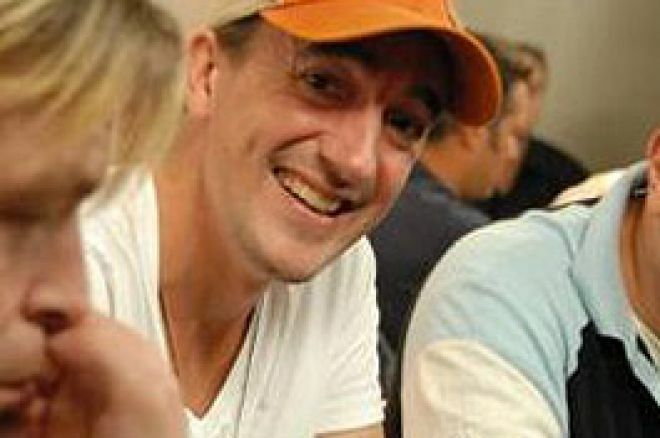 Andy Bloch and Phil Hellmuth also exited, and Phil Gordon was eliminated late in the day when he and Joe Beevers got their short stacks in the middle in Omaha Hi/Lo. Gordon held to Beevers' . The board read when all the chips went in, and a king on the river finished Gordon's tournament, missing his draws. Beevers more than doubled up on the hand and finished the day with 10,000 in chips. Johnny Chan was one of the last high-profile eliminations of Day 1, falling to Gus Hansen in Stud Hi/Lo when Hansen made a wheel to send the ten-time WSOP champion to the rail. Alex Kravchenko finished Day 1 among the top ten chip stacks, continuing a big year for the young Russian. Kravchenko picked up his first WSOP bracelet in SHOE at the WSOP this summer to go with his five other cashes, including a fourth-place finish at the Main Event. Among the 51 survivors of Day 1 were three of the four women registered for the tournament. Jennifer Harman held the chip lead late in the day before being passed in the last level by Kirk Morrison. Annie Duke and Barbara Lewis ended Day 1 play mot far outside the top ten. Lewis cashed four times in the WSOP 2007, in Limit Hold 'Em, Razz, Stud and Stud Hi/Lo. Other survivors from Day 1 included Justin 'ZeeJustin' Bonomo, Nikolaus Jedlicka, Eli Elezra, Jon 'Pearljammer' Turner, Chris 'Jesus' Ferguson, Gus Hansen and John Juanda. Join Pokernews tomorrow at 2PM local time (9AM ET/6AM PT) to watch all the interviews and live updates as the 51 players winnow down to a final table of eight, all in search of the first-ever WSOP Europe bracelet.